There was no shortage of stunned faces in the audience when Nokia CEO Stephen Elop announced the 808 PureView at Mobile World Congress 17 months ago. Who would have thought a Symbian-powered device would be a show-stealer -- in 2012? After all, Elop had all but declared the platform dead one year before, and the idea of a smartphone with a 41-megapixel camera was an industry first. Questions lingered immediately after: how is that actually going to work on a phone? Why Symbian? And when would it show up on Windows Phone, Nokia's OS of choice? As it turns out, the 808 PureView was the culmination of five years' worth of imaging experts putting their heads together, and Nokia wanted to get the proof of concept out the door while getting the innovative tech ready for Windows Phone. A few months after the 808's release, we started seeing the first fruits of this effort in the Lumia 920, but there was work yet to be done. Finally, the time has come for the company to launch the 808's WP8 counterpart, the Lumia 1020, and it's launching on AT&T this Friday for $300 as a US exclusive. We were able to peel ourselves away from taking pictures long enough to jot down a few thoughts, so shoot below the break to take a closer look. The Lumia 1020 is the best Windows Phone we've used so far and offers the best camera in the industry, though it's a little difficult to hold comfortably. 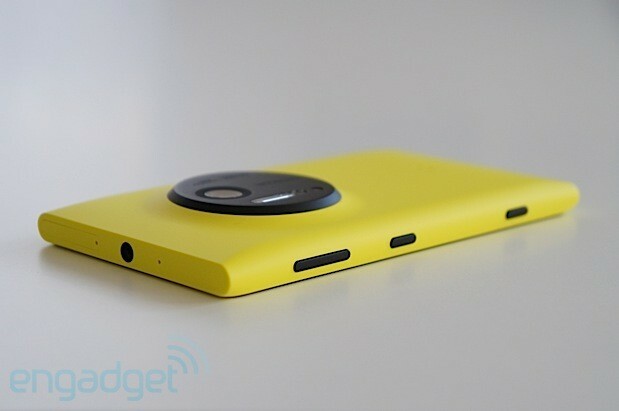 How would you rate the Lumia 1020? The Lumia 1020 comes in three colors (yellow, black and white), each with a matte finish and a coating that's both fingerprint- and dirt-resistant. We much prefer this over a glossy phone any day, and while we didn't give the handset a full nature facial to test that second feature, we can at least confirm that fingerprints barely made an appearance during our time with the device. Additionally, the sides and back of the 1020 are smooth and rounded, much like a well-polished pebble, and the top and bottom are flat, which is fantastic if you ever want to position the phone upright. 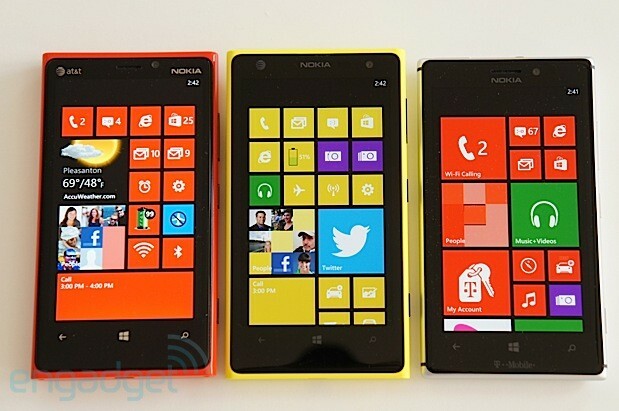 In many respects, it looks like a cross between the Lumia 800 and 920. That's not necessarily a bad thing, but it does have a drawback or two. Sadly, the matte finish wasn't enough texture to provide us with a better grip, so the phone's ability to slip out of my hands didn't go unnoticed -- especially when trying to remove it from my pocket. The good news is that at 5.57 ounces (158g) the 1020 actually weighs significantly less than the 920 (6.53 ounces), whose heft was one of our biggest gripes when we reviewed it. It's also 10.4mm (0.41 inch) thick -- abysmal when compared to most other high-end devices currently on the market, but still 0.3mm thinner than the 920. Unfortunately, it's also 0.6mm wider. This may not sound like much, but it makes a big difference in terms of how it feels in-hand, especially when you factor in the large camera module that takes up so much space on the rear side. Yes, the two elements make for a rather awkward hand-held experience; when the smartphone rests normally in your palms, your fingers will drape uncomfortably across that module in the back. 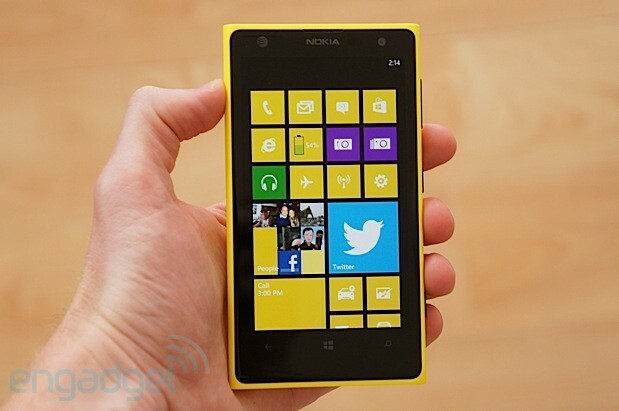 If you've used the Lumia 920, it won't take you long to figure out where everything is on the 1020. The micro-SIM tray and 3.5mm headphone jack sit atop the device, with the volume rocker, power button and hardware shutter key (all aluminum) situated on the right. Down below you'll find the micro-USB port and a speaker grille; what sets it apart from the 920 is the addition of a lanyard hole and a change in how the speakers are laid out. The front features a 4.5-inch WXGA display, with a 1.2-megapixel wide-angle front-facing camera in the top-right corner, an earpiece just to its left, and -- on our AT&T-branded review unit -- a globe logo sitting by itself in the top-left corner. (This is the extent of any exterior carrier branding, fortunately.) The standard suite of capacitive buttons (back, home and search keys) can be found below the screen, just as you'd expect. Moving on to the back, it's hard not to notice the monstrous camera bump taking up tons of space. It's an aluminum circular module with the lens on top and two flashes -- LED for video and focus assist, and Xenon for stills -- lining the left side. The rest is taken up with Nokia's logo and lettering signifying its megapixel prowess. There's no mistaking the bump, to be sure, as it protrudes proudly from the phone's chassis; this means the 1020 won't be able to sit flat on its back when you want to place it on a table or other surface. Of course, it's still much thinner (albeit larger and flatter) than the 808 PureView's module, so we're hoping that future generations of the device will get progressively less awkward. 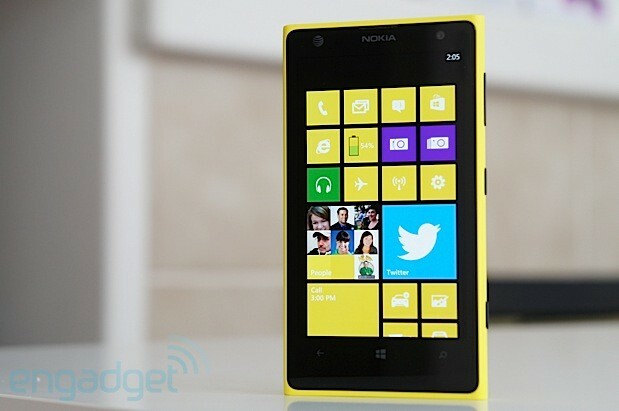 The Lumia 1020 comes with 32GB of internal storage. 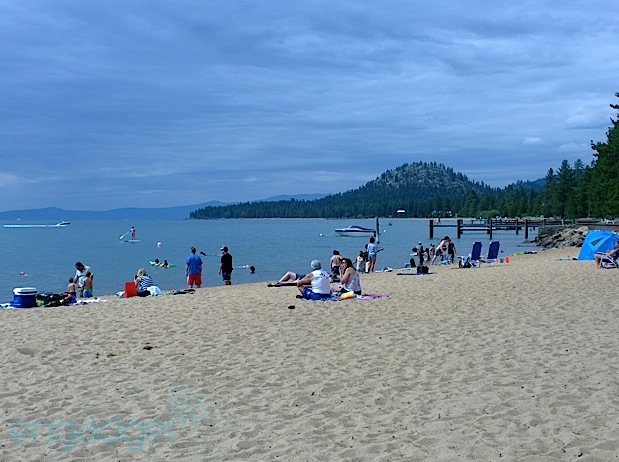 This is normally plenty of space for most users, but be careful if you plan on taking full advantage of the phone's numerous camera features; after taking lots of pictures over the course of two days, we easily amassed a couple gigabytes of images. We'd love to see a 64GB option for the enthusiasts out there (there have been reports that it's heading to Telefonica in Europe and Latin America as an exclusive), but as this isn't likely to find its way stateside anytime soon, just make sure you're regularly backing up your prized shots. The 4.5-inch WXGA (1,280 x 768) display has the same resolution as the Lumia 920 and 925, though the 1020 uses the same AMOLED "PureMotion HD+" panel as the latter (the 920's is LCD). And it's certainly every bit as beautiful to behold as before. Thanks to the fact that the blacks in the screen are nearly indistinguishable from the bezel, the display itself feels a bit more expansive than normal. You also have a few options at your disposal to adjust not just the master brightness setting, but also the sunlight readability, touch sensitivity and Lumia color profile (this involves tweaking the saturation and temperature of the color being shown on the screen). The viewing angles are incredibly wide; the screen is easy to see in direct sunlight; and the colors pop without overdoing it on the saturation. For radios, the AT&T version (RM-877) has quad-band LTE (bands 2, 4, 5 and 17, though you won't use most of them until AT&T enables them. It also features quad-band HSPA+ (850 / 900 / 1900 / 2100) capable of speeds up to 42 Mbps and quad-band GSM / EDGE (850 / 900 / 1800 / 1900). According to the FCC docs, this unit technically also features AWS HSPA+, but it appears to be disabled on the AT&T units. Additionally, the 1020 features NFC, Bluetooth 3.0 and USB 2.0. We've included the full spec sheet below. Windows Phones require very little explanation on the firmware side, since Microsoft maintains a consistent user experience across the board. Because of this, there isn't much to surprise users who are already familiar with the Live Tile-smattered mobile OS; you already know what to expect, and we won't go into a lot of detail on the platform's features here. With that said, the Lumia 1020, much like most of Nokia's Windows Phones, includes a full suite of OEM- and carrier-specific applications -- more than 20, in fact. This includes Nokia Care, Music, Pro Cam, Smart Cam, as well as a set of Here-based programs, such as City Lens, Drive+ Beta, Maps and Transit. On the AT&T side, you'll see Address Book, FamilyMap, Locker, Navigator, Radio, Mobile TV, myAT&T and YPMobile, all of which can be easily uninstalled if you don't find any use for them. There's also ESPN Hub, Wallet and a bunch of imaging-centric lenses, which we'll discuss in more detail in the next section. The 1020 also offers the same quick glance screen that we saw on the Lumia 925, which allows users to check the time while the screen is off; you can disable this feature or, if you prefer, add a night mode that dims the glance's brightness automatically during the hours of your choice. The protruding module. The wondrous sounds of a mechanical shutter. Two different types of flash. The list goes on. You can't not notice how central a role the camera plays in the Lumia 1020's existence. Its whole purpose is to ensure that you, dear photography enthusiast, can enjoy the closest thing to a DSLR-like imaging experience on a smartphone. Perhaps likening it to a top-notch Canon or Nikon is a bit much -- we have a hard time believing that a phone is ready to replace professional-quality equipment -- but devices like the 808 PureView and the 1020 are giving some of the best point-and-shoots a run for their money. Such a possibility was a laughable concept at best a few years ago, so how is Nokia pulling it off? If you've read up on the 808 and researched the idea of PureView, you'll realize that Nokia's second-generation approach to the tech isn't foreign. It's simply applying many of the clever imaging principles already used in the 808 and improving them, adding them to a more relevant operating system and throwing in a few additional features to make it even more tantalizing. We figure it's best to start from the beginning and offer a brief history lesson on what PureView is all about. The 808 PureView camera boasted a whopping 41-megapixel CMOS, which sounds intimidating -- after all, the mainstream smartphone market still hadn't begun producing devices with 13MP cameras yet, so 41 felt like an awfully big leap. So what's the point of having so many pixels at one's disposal? In short, the magic is in oversampling. While it's possible to snap 38MP (and 34MP wide-angle) images at will, the 808 has a "creative mode" which takes lower-res shots -- eight, five and three megapixels, to be precise. Not only are these images easier to share, the phone oversamples the images, which means it combines several pixels to create one high-quality superpixel. The idea behind this is to add sharpness, reduce noise, eliminate Bayer-pattern problems and improve low-light performance. It also helps the camera achieve another superpower: lossless zoom. In other words, you can zoom in on an object without losing detail and resorting to interpolation. 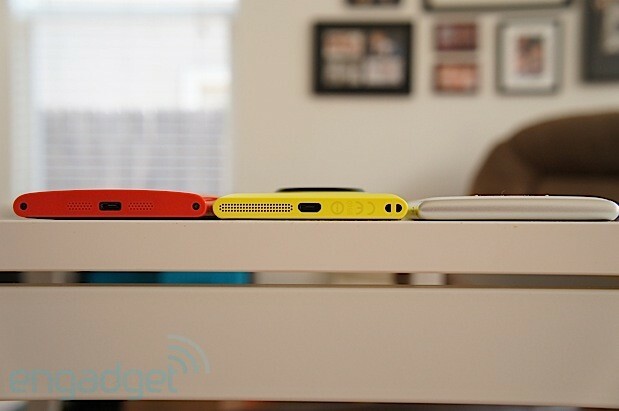 Fast-forward to the Lumia 1020, which takes the PureView tech and improves upon it. Instead of having to choose between creative mode and high-res shots, the 1020 now takes both simultaneously, giving you a 38MP photo (34MP for wide-angle) and an oversampled 5MP version with lossless zoom as well. The camera benefits from a six-element lens array (compared to the 808's five), which consists of five plastic lenses and one made of glass. With the new device also came a shift from an FSI sensor to BSI and a wider aperture (it's now f/2.2, compared to f/2.4 on the 808). Both of these factors equate to better low-light performance, but that's not all: the phone also offers barrel-shift optical image stabilization (OIS), thanks to a set of ball bearings that are moved by tiny motors anytime the gyroscope detects shaking. Pro tip: activate the camera and wobble the phone to hear the various parts moving around inside. Let's dive into more technical specs. At 1/1.5 inch, the sensor is significantly larger than any other flagship device (the GS4 is 1/3.06 inch, whereas the One is 1/3 inch), but it's slightly smaller than the 808's 1/1.2-inch offering. The size of each pixel is 1.12µm, which is the same as the GS4, but smaller than the 808. The 1020's 35mm equivalent focal length is 26mm, which is more than three times as long as the 808's 8mm offering. (Update: it appears that the 808's 35mm equivalent focal length is actually 26mm for 16:9 and 28mm for 4:3. Thanks, @bharadc23!) Minimum focus distance for macro shots is set at 15cm. Curiously, the Lumia 1020 comes with a Qualcomm Snapdragon S4 Plus chipset. This is standard fare for Windows Phones, but it's interesting to note that the SoC technically doesn't support such high-resolution cameras. According to Anandtech's Brian Klug, Nokia collaborated with Qualcomm to do a complete rewrite of the chipset's imaging stack in order to make everything work properly. With that said, a future update to the platform referred to as GDR3 will reportedly support Snapdragon 800 chipsets that are capable of getting up to 55MP, which is a pretty solid indication that future generations of Nokia's PureView lineup will continue to increase in resolution and features. 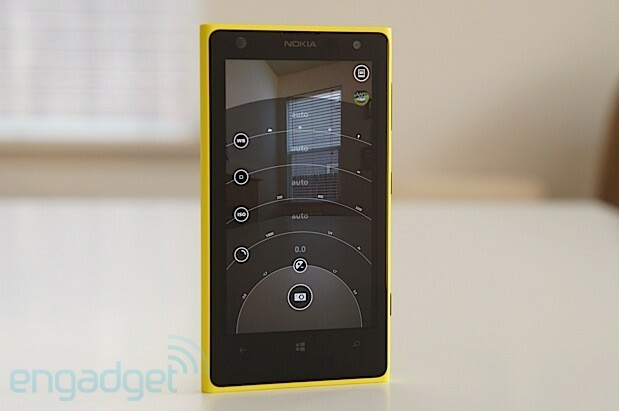 The stock Windows Phone camera application is for chumps, and Nokia's goal is to prove it. While you can use the vanilla app if you prefer, we have no idea what benefit you'd get from doing so -- images taken within the app are limited to 5MP, regardless of which aspect ratio you choose. The default lens featured on the Lumia 1020 is called the Nokia Pro Cam, and it's the most comprehensive WP8 imaging app we've ever used (and arguably one of the best on any platform). The user experience is pretty intuitive, and it has more manual adjustment options than we're used to enjoying. Drag the virtual shutter key slightly to the left and something that looks like your grade school's diagram of the Solar System appears before your very eyes. It's set up as a series of sliders, each one representing a different adjustment setting: white balance, manual focus, ISO (up to 3200), shutter speed (1/16,000 to 4 seconds) and EV are all here, many of which have the ability to adjust in real time. Try changing the white balance settings, for instance, and the viewfinder instantly shows you what your picture should look like. You can switch from stills to video by sliding your finger down on the shutter key. To work the digital zoom, slide your fingers up and down on the viewfinder. In the top-left corner, you'll find options to either edit your last shot or go directly into the camera roll. An icon in the bottom-right corner lets you switch to other lenses, such as Cinemagraph, Panorama, Smart Cam or others. Lastly, a series of three dots in the top-right corner is your go-to place for settings and miscellaneous menu options: this is where you can switch to the front-facing camera, enable shutter delay and change the shortcut assigned to your hardware shutter button. This is also where you'll find the toggle to go back and forth from standard 38MP images to wide-angle 34MP (and vice versa, of course). Additionally, you can snap just 5MP shots if you don't want a high-res shot hogging up storage space. Frankly, this toggle is the only letdown about the user interface -- we'd much prefer the ability to switch back and forth directly from the viewfinder, instead of taking three extra clicks to get the same desired effect. 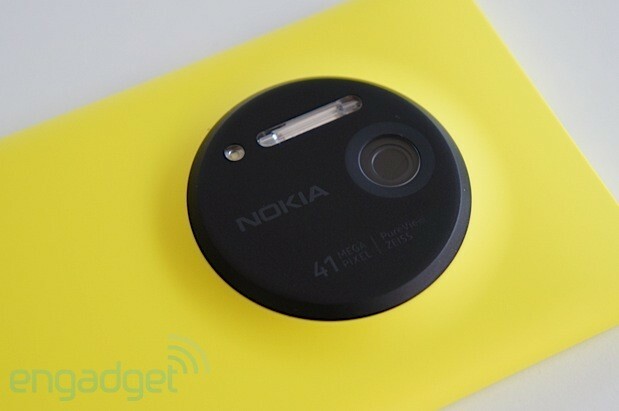 As briefly mentioned earlier, Nokia's also thrown in its Smart Cam lens, already available on the Lumia 925. It's worth a brief mention, at least, since it will undoubtedly play a significant role in how you use the 1020's camera. Smart Cam takes a series of burst shots over the course of a few seconds; from there, you can grab the best shot, an action shot (think Drama Mode for the Galaxy S 4), add blurring to emphasize motion or remove photobombers (just like Eraser Mode on the GS4). Fortunately, you can do multiple things with the same series of photos: for instance, you can save your action shot and then go back and do something else. Creative Studio is an image manipulation app included as part of the overall imaging package on the 1020. 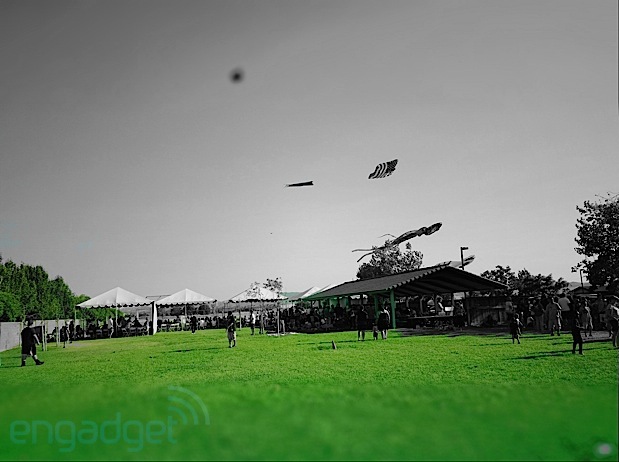 Introduced on the Lumia 925, it offers a few post-production, Photoshop-like techniques to add a little extra flair to your high-res photos: you can manipulate focus, blur, color (giving you the chance to highlight specific hues, as seen above) and make a collage, among other things. All of your saved photos, regardless of which Nokia lens or app you use to create it, get aggregated into the camera roll. Each of them can be edited after the fact by clicking on the app link that shows up underneath. The same goes for high-res photos: while the camera roll only features the 5MP versions, head into the edit option to behold it in all its full-res glory. Speaking of which, one of the editing features we enjoyed was the reframe option. This gives you the chance to straighten out crooked pictures, rotate your image or change the aspect ratio (3:2, 1:1, 16:9 and 4:3 are all there). Additionally, the unveiling of the 1020 brought about the introduction of Nokia's new imaging SDK, which is currently in beta and offers developers access to many of the PureView features and APIs; in fact, Creative Studio was developed using the SDK. Devs can take advantage of partial JPEG decoding, the ability to offer cropping and reformatting, full WP8 compatibility and up to 50 filters and effects. 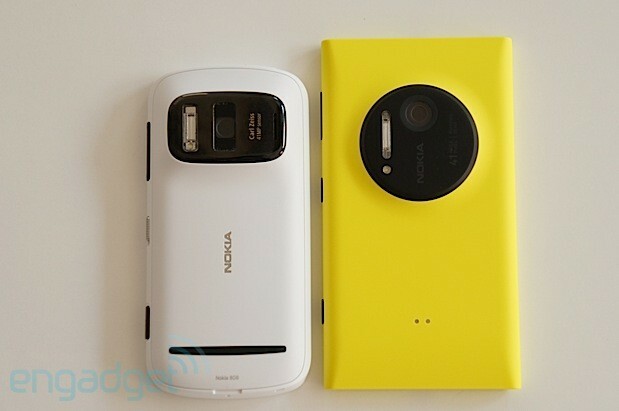 So we've gone into a lot of detail about how the Lumia 1020 camera works, which undoubtedly has a lot of you drooling. Nokia has a lengthy history of backing up its boastful imaging claims, and fortunately that reputation continues with the 1020. Simply put, the camera is stunning. In most situations, the automatic settings work well, especially when it comes to white balance, low light and focus. But the camera shines even brighter if you get adventurous and start tinkering with manual settings. Images taken in the dark turned out with more light, more detail and less noise than the HTC One and 808. The lossless zoom on the 1020 completely blew us away; we could legibly see signs from a distance of over 100 yards, and we were able to zoom in on faces of people who were barely noticeable in the original image. We were also very impressed by the vast amount of detail in every shot. As you can imagine, there's a lot to love. No camera is perfect, however. When taking pictures in the shade, we noticed that colors popped a little too much compared to other flagship cameras we tested -- in fact, there were times they didn't appear natural (though this could potentially be fixed in post-processing). We also noticed that the 1020 struggled with the high end of the dynamic range at times; for instance, the camera was unable to pick out details in the wall of a sunlit building that the 808 and Galaxy S 4 had no problem seeing. The 1020 lacks neutral density, a feature that the 808 possessed and aids the camera in really bright light; unfortunately it takes up space, which is a possible reason why it was left out in this iteration. Of course, many of these observations are only potential problems when you're using auto mode. Most people interested in buying this phone are likely a bit more savvy in the imaging department and are willing to play around with the settings, and this is where the 1020 makes the biggest difference. ISO, shutter speed, white balance, EV and manual focus are easily tweakable, which means you have free creative reign in making the camera take whatever photos you want. It's amazing what just a few minor adjustments can do -- especially in low light. We'll continue to experiment with the camera's capabilities and report our findings in an upcoming feature; if you'd like to take a look at our high-resolution images, we'll have them available for your perusal shortly. Update: for high-res images, head here; we also added a set of 5MP shots here. By default, the 1020 records video in 1080p and at 30 frames per second (encoded at a bit rate of 20 Mbps). Since the phone is all about customizable options and manual control, however, you can also set your movies to record at a resolution of 720p along with frame rates of 24 and 25 fps (for both resolutions). 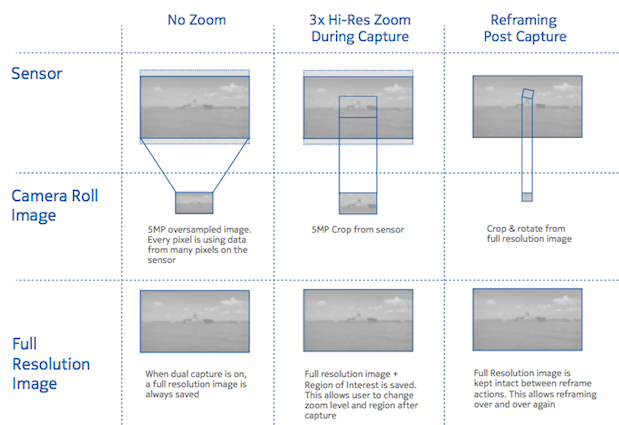 The lossless zoom applies to video as well as stills: full HD is capable of 4X, while 720p bumps that number up to 6X. Rounding out the manual adjustments are white balance and focus lock, as well as a tweakable audio bass filter that lets you tune out lower frequencies -- ultra handy in cases of wind and traffic. We were impressed by how smoothly the camera was able to handle jostling, shaky hands and a little panning. While phones with 1080p video capture are a dime a dozen in this industry, very few actually do a good job of making you feel like you're actually watching a high-def video; fortunately, the 1020 is one of those few. The camcorder is capable of doing either continuous, macro or infinity focus, but we would've liked the opportunity to do our own manual adjustments for those few cases in which we wanted to focus on different parts of the screen or when the camera didn't focus properly on its own. The audio is encoded at a bit rate of 256 Kbps and a sampling rate of 48KHz, but we found a bug: any audio we captured using the Pro Camera lens wound up with one dominant channel. In other words, video playback sounded like it had been recorded in mono, despite the fact that an ever-so-tiny amount of audio crept out of the second channel. We didn't experience any of these problems in the stock camera app, so we'll get a new unit from Nokia shortly to see if this is just limited to our own device and will update our review after we've done some more testing. So how does the phone perform, aside from the camera? Pretty well, but was there any doubt? Regardless of your views toward (or against) Windows Phone, we've rarely encountered any problems on WP8 -- especially when a dual-core Snapdragon S4 is involved. Fortunately, that's true of the 1020 too: it sports an S4 Plus chipset with Adreno 225 GPU and 2GB RAM, so it's certainly got some oomph behind it. Of course, given the raw power necessary to process images, a couple gigabytes almost seem like the minimum requirement. As far as normal tasks go, the screen is responsive, the phone seldom stutters and multitasking is incredibly smooth. The 1020 benefits from a 2,000mAh battery, which should serve most power users quite well; Windows Phones have a reputation for being power-efficient, and the 1020's AMOLED panel doesn't require quite as much energy to operate. In most cases, we were able to use the device as we normally would -- this includes taking a ton of pictures and videos for this review -- for around 12 to 14 hours before it died. Granted, the WPBench battery endurance test indicates that battery life is weaker with processor-intensive activities than the 920 or 925, but with normal usage, runtime still appears to be better than what we usually see on other platforms. As an additional note of caution, it appears that the battery drains faster when you're making manual imaging adjustments, as opposed to when you let the camera make the decisions for you. The speakers are perfectly average for listening to music and movies, mainly due to the volume. We typically didn't have a problem hearing details in podcasts or songs when the phone was within a foot or two, but as soon as we stepped away from it to walk across the room, we noticed that the lows were barely audible at all -- even when the speakers were facing our direction without any obstruction. While calls were also pretty clear, the voices on the other end sounded slightly tinny, though it wasn't so bad that it distracted from our conversation. Lastly, GPS was able to find our location within just a few seconds. Not all is bunnies and butterfly kisses with the 1020's general performance, as we came across a couple rather significant bugs that could be a cause for concern. First, we were never able to get the mic to work when we were on speakerphone, even after making several test calls. Secondly, on one occasion, our review unit's buttons completely froze -- we could use the touch screen, but none of the hardware or capacitive keys responded in any fashion. Taking the SIM out and putting it in, an action that normally forces the phone to reboot, did nothing; we were only able to get it to work properly after holding the down volume, power and shutter keys for several seconds. We'll receive an extra review unit to test out these oddities and we'll update our review when we know if we're able to replicate the bugs. But what if you have to make the switch from another platform? That question is unfortunately much more difficult to answer. While Windows Phone has come a long ways since its days as a nascent OS, Android and iOS users -- many of whom likely content with the selection of apps and services currently offered to them -- will need to weigh the pros and cons carefully. Plenty of flagship phones have really good cameras. They just aren't this good. So is it worth leaving your comfort zone and forging a new path to imaging bliss? If taking fabulous glamour shots are that important to you, the decision to switch (or not to switch) has never been so tempting.